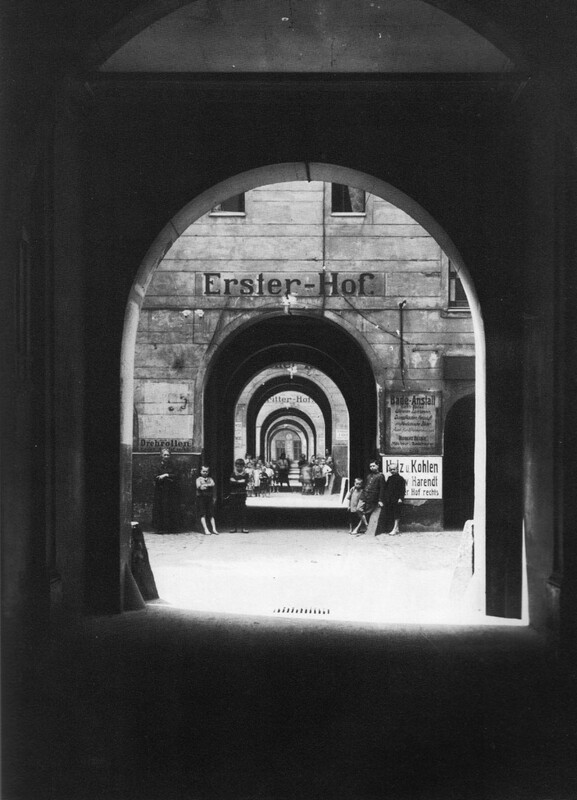 In their digital project, DLA Fellow Florence Feiereisen (German Department) and colleague Erin Sassin (History of Art and Architecture) explore the soundscapes and architectural spaces of the Meyershof building in Berlin, circa 1932. We continue to work full steam ahead on our audible architectural history project! Our ultimate goal is to create a website that allows to visually and aurally experience Meyershof, a large Mietskaserne (tenement building, literally a “rental barrack”) that was constructed in the working-class neighborhood of Berlin-Wedding in 1873/74 and remained there until Allied bombing destroyed the structure toward the end of World War II. Through 3D modeling, soundscapes, and animations of aggregate historical figures who serve as guides to the building, our project creatively uses digital technology to offer new ways of accessing the sensorial experiences of working-class Berliners. We have started from extensive empirical research, and are now adding digital dimensions to contribute to emerging scholarly literatures in sensory studies, architectural and urban history, and related fields. We are particularly interested in how digital tactics allow for more subtle analysis and presentation of the acoustic ecology of the building. We want to hear as well as see how sensory perceptions shaped—and were shaped by—class consciousness as well as class conflict in early-twentieth century Berlin. We use 1932 as a key temporal moment because it was when residents of Meyershof joined a city-wide rental strike and the building became a Communist Party stronghold in the rise of fascism in Germany. While descriptions of Meyershof are vivid and, indeed, capture most senses, we found it curious that publications of the time do not feature noise complaints in the context of working class accommodations, even though the soundscapes of working class life were louder and more complex than in pre-industrial society. Hence, our project not only includes a 3D model of Meyershof in 1932 and evocations of the sounds within the building, but also the composite portrayal of four residents who guide visitors around our website as they navigate the aural dimensions of their daily lives, which could be cacophonous or quiet, but always profoundly modern in the context of mid-twentieth century Berlin. The ambient sounds of a mother doing piecework in her kitchen at night in Cross Building #1, a preliminary soundscape for Meyershof ca. 1932, created by Bilal Khan, Kat Finck, Mikaela Chang in Professor of the Practice Erin Davis’s Introduction to Podcasting course, J-Term 2018. Funding from the DLA has supported me as a year-long fellow as well as research assistance by two very talented Middlebury students: Emma Harnett, who has begun to construct a 3D model of Meyershof in SketchUp, and and Oliver Oglesby, who has begun to design a web interface for the project. Currently, we are working on a talk we’ll give at the Vernacular Architecture Forum in Alexandria, Virginia in May and we are creating the four fictional characters (aggregate figures based closely on historical data). The next step will be to finalize our 3D model and recreate/produce soundscapes that evoke life in Meyershof around the year 1932. You’ll hear the ambient sounds of a mother doing piecework in her kitchen at night in Cross Building #1, the roaring of newly acquired engines in workshops located in the back buildings, and the sounds of Bakery Royl’s kitchen in the front building. With the help of DLA funding, we will be attending the DHSI (Digital Humanities Summer Institute) in Victoria, British Columbia in June so that we can learn more about digital soundscape creation. We will report back to to the Middlebury DLA community on what we learn.